Still from Adventure of the Eyes of Mr WS, a Test-Pilot (1953/86), video, 4 min 55 sec. © Katsuhiro Yamaguchi, Courtesy Taka Ishii Gallery. Throughout a career that spans the late 1940s to the present, Katsuhiro Yamaguchi has consistently proven to be one of Japan’s most visionary artists, distinguished by his restless curiosity about new media and new means of artistic expression, and a powerful intellect that has been expressed not only through artworks but also through the organization of exhibitions and symposia and in numerous analytical and discursive publications synthesizing wide swaths of international art history. 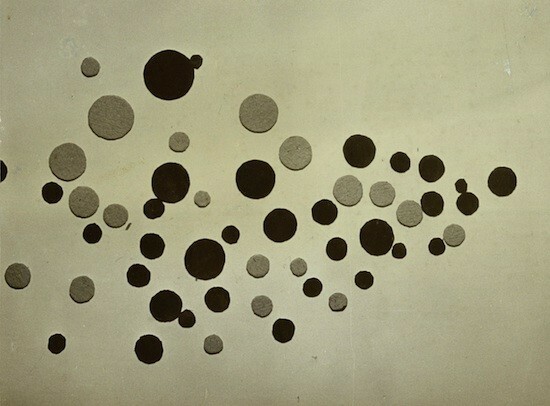 In 1951 at the age of 22, Yamaguchi was one of the founding members of the Tokyo-based intermedia avant-garde art group Jikken Kobo (Experimental Workshop), brought together and named by the influential poet and critic Shuzo Takiguchi. Including Yamaguchi, Jikken Kobo comprised 12 artists, composers and musicians as well as a lighting technician and a writer. During the roughly seven years the group was active, its members produced performances, stage sets and audio-visual events, including a series of works from 1953 made with the newly introduced technology of the auto-slide projector, which allowed for slideshows of still images to be synchronized with sound recordings. Following the disbandment of Jikken Kobo in 1957, Yamaguchi continued making works on his own as well as in collaboration with other artists. Investigating the interactions between artwork and viewer, his 1950s-era “Vitrine” series of graphic abstractions distorted by rippled glass covers led in the 1960s to fabric assemblages and sculptural works incorporating the use of colored light that destabilized the architecture of the gallery space. 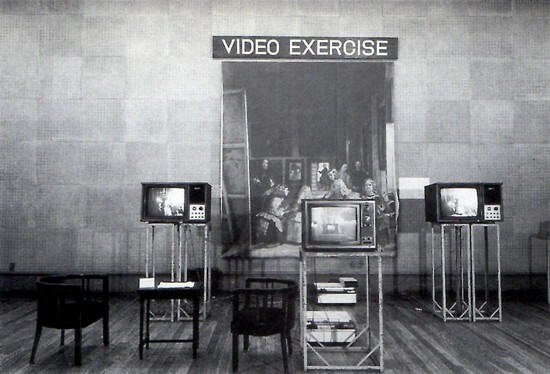 Together with Yoshiaki Tono, in 1968 Yamaguchi premiered Japan’s first art video event at the multiday symposium “Expose 68: Say Something Now, I’m Looking for Something to Say.” This was followed in 1972 by Yamaguchi’s establishment of the collective Video Hiroba (Video Plaza) along with 12 other artists to further innovate the use of video in Japanese contemporary art. Around this time Yamaguchi began to articulate in writing the ideas on performance, interaction and new media that had been apparent even in his earliest works. Combined with a potent dose of futurist vision, this process led to the artist’s formulation of his fundamental working concept, the Imaginarium. Anticipating the Internet’s user-generated content, Yamaguchi hoped that through the implementation of the Imaginarium, viewers and producers of images could be connected in the act of seeing through what he termed “imaginary performances,” facilitated by universal access to video reproduction technology. He astutely observed that the spread of electronic reproduction media shifted the relationship between viewer and the site of viewing from the act of quotation to the mechanics of quotation, and embraced the creative potential of the inevitable “break-downs” in those mechanics. Now 82-years-old, Yamaguchi remains active, revising his thoughts on the Imaginarium, planning new works and developing an exhibition that he hopes will be the definitive presentation on Jikken Kobo. ART iT met with Yamaguchi to revisit his activities from across his career and discuss how his ideas on art and technology have changed since the arrival of the 21st century. Additionally, the artist has kindly allowed ART iT to reproduce two key texts elaborating his Imaginarium concept, 1977’s “Experiment on Imaginarium” and 1981’s “Imaginarium.” These texts are presented here in revised translations of the versions that appear in English and Japanese in the 1981 monograph Yamaguchi Katsuhiro 360º (Rikuyosha). *Special thanks to Christophe Charles, Faculty of Imaging Arts and Sciences, Musashino Art University. Installation view of Las Meninas (1974-75), video installation with mixed media. All images: Unless otherwise noted, © and courtesy Katsuhiro Yamaguchi. ART iT: A major theme running through your essays and books is the relationship between art and technology. As technology has gradually evolved from mechanics to digitization, have you had any chance to reevaluate your thoughts about your ideas? KY: Two issues that I was concerned with from early on were digitization and robotics in addition to the broader themes of art and technology or the development of video art. These were issues that I explored through various groups that I formed following Jikken Kobo, like Video Hiroba or Arts Unis. If you look through my monograph Yamaguchi Katsuhiro 360° (Rikuyosha, 1981), I think you would understand most of what I was trying to express about art and technology. Specifically, if you read my thesis on the Imaginarium, which is my fundamental concept, then you will find answers to your question. ART iT: So over time has your thinking about the Imaginarium changed at all? KY: My ideas about the Imaginarium – that is, the creation of sites for interactive communication with viewers through the use of video’s live feedback functions – are constantly evolving. But from the start I was always vocal about promoting the concept. For example, in 1990 when the Tokyo Metropolitan Museum of Photography was established I pushed the museum to focus not only on photography but also on moving images, and later that year based on my ideas the museum organized the exhibition “Imaginarium I,” meant to be part of a series investigating the concept. ART iT: Regarding the Imaginarium, you have previously raised the issue of whether it is necessary to preserve objects themselves, at one point invoking the example of traditional “renku” poetry gatherings where the focus was on the live communication of participants’ collective improvisations, and where the sheets of paper recording the poems were discarded after the conclusion of the event. I believe this position stems from the concept’s focus on creating a site for “imaginary performance” rather than a “work of art” per se, but ultimately, as in the case of your projects from the 1950s with Jikken Kobo, once the objects disappear, nothing remains. I’m not sure whether this was also something you considered, but obviously as technology develops, works may “die out” as different media become obsolete. How does this factor into the realization of the Imaginarium? KY: When we were active as Jikken Kobo I still hadn’t come up with the Imaginarium concept. But the name, “Experimental Workshop,” which the poet and critic Shuzo Takiguchi chose for us, was always meant to communicate the sense of a “virtual” workshop. I think this is perhaps the most important aspect of what we did, this idea of the “virtual” workshop. Takiguchi’s choice of the name for us was brilliant. And then after us in the 1960s there were intermedia groups like Experiments in Art and Technology (EAT) in New York with John Cage and Robert Rauschenberg and Trisha Brown all collaborating across the fields of art, music and dance in experimental projects and performances. So in a way we could be considered their predecessors. 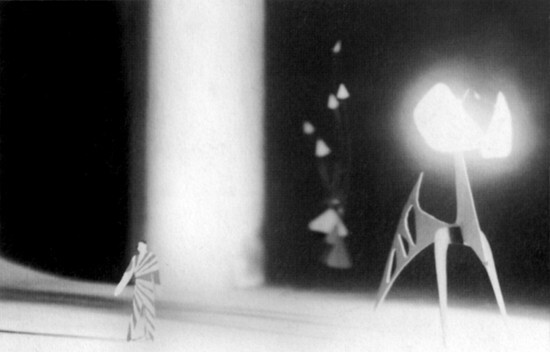 Maquette for stage design of Ballet Joie de Vivre for the “1st Jikken Kobo Presentation.” Picasso Festival, Hibiya Kokaido Hall, November 16, 1951. 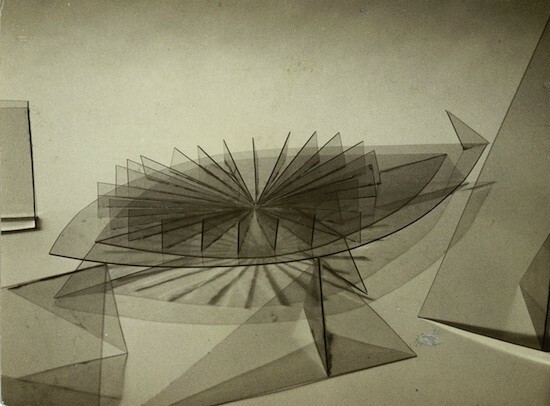 KY: There are a few photographs still around, and the experimental film that we made, Ginrin (Silver Wheel, 1955). But even now I am still planning new projects based on the Imaginarium concept, continuing with my earlier works based on environmental installations that incorporate the audience. There is one idea I had that I still haven’t been able to realize, the “Project for Flame-Water Fountain” conceived in 1974, which is outlined in Yamaguchi 360° – a kind of performative environment with water and fire, video cameras and monitors. Regarding Jikken Kobo, we are planning an exhibition for 2012 at a museum in the Tokyo area. Because we didn’t have recording devices like video in the 1950s, we no longer have any of documentation of the original works that we made in 1953 using Sony’s auto-slide projector [actually produced by the precursor to Sony, Tokyo Telecommunications Engineering Corporation]. Nor do we have any documentation of our performances or concerts. We still have the scores though, and have sound recordings from some re-stagings we had done previously. Of course, it’s regrettable but many of our members are no longer alive. So we are hoping that this exhibition will be the definitive presentation on Jikken Kobo. This time I plan to document everything as precisely as possible. Right now everything is fragmentary. For example, I was able to recreate the set design for the ballet we staged for our first collaboration as Jikken Kobo in 1951, with the score and design all based on Picasso’s painting The Joy of Life. I received some money to do the recreation when I was teaching at Kobe Design University in the 1990s. But I also hope in some way to recreate Hideko Fukushima’s original costume designs for the performance. In any case, many of the works on display in the upcoming exhibition will be recreations. ART iT: As for the Imaginarium, in 1970 you were the director of the Mitsui Group Pavilion, “Space Review,” at the Osaka Expo. I think it’s possible to consider the pavilion an early realization of the Imaginarium, but at this time had you already started articulating the concept? KY: I would say so. The idea of integrating the audience was always part of my approach to art, even from the start. ART iT: Of course, the genre of media art focuses on projects that involve cutting-edge technology, but more than integrating the audience, such works often seem to focus on the technology itself. How do you feel about such art? KY: It’s like a demonstration of technology, typified by the works that often appear in Ars Electronica. I want to oppose that kind of art. I have been working on a DVD format project, entitled Icarus, that critiques such an approach, and in fact have just completed it. 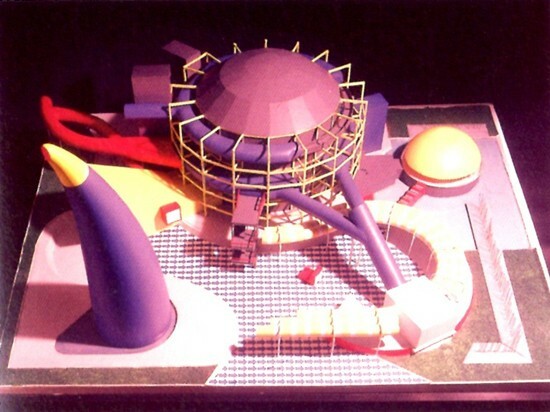 Above: Maquette for Mitsui Group Pavilion, EXPO’70, Osaka. 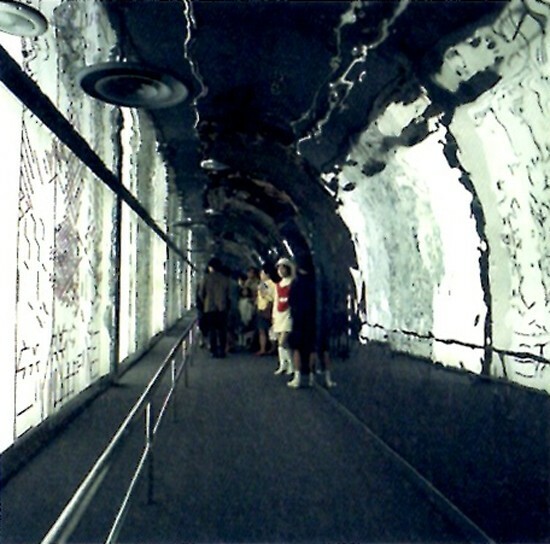 Below: Interior view of Mitsui Group Pavilion, EXPO’70, Osaka. ART iT: It definitely seems that in contrast to “Ars Electronica,” many of your works evolve from deep consideration of the relationship between society and art. Ultimately the idea of technology art has developed somewhat awkwardly into its own artistic field. KY: This may actually be the result of my own teaching of art and technology at university, so I have to take responsibility for contributing to that development, which is why I made this most recent work. I always love to throw out new complications. KY: In the 1970s I started thinking about performance and appearing in different talks and events about the subject, as well as writing books such as Performance Discourse (1985, Asahi Press). A central concern for me was technology’s intimate relationship with performance through its ability to expand our physical capabilities. ART iT: But you have also written that even as we use technology in art it’s important to “break it,” and it seems that your idea of taking that further to “break down” your own works is relatively rare today. KY; It’s always necessary to approach issues from a critical perspective. Before joining Jikken Kobo, I graduated from the law program of Nihon University, where I studied the sociology of law and legal philosophy. Bertrand Russell’s A History of Western Philosophy was one of the key texts that I was reading at the time. And then I was also into phenomenology. I started reading Husserl from when I was still a child and somehow that phenomenological mentality stayed with me. So for me art is deeply integrated with these three other interests: phenomenology, sociology and philosophy. ART iT: How exactly did you come across Husserl while you were still a child? It seems like a pretty rare experience for anybody to have. KY: It was completely by chance. My father, a lawyer, was shocked to find me reading Husserl. I found his books at a bookstore. I used to love going to bookstores to search for books old and new, and was always reading. 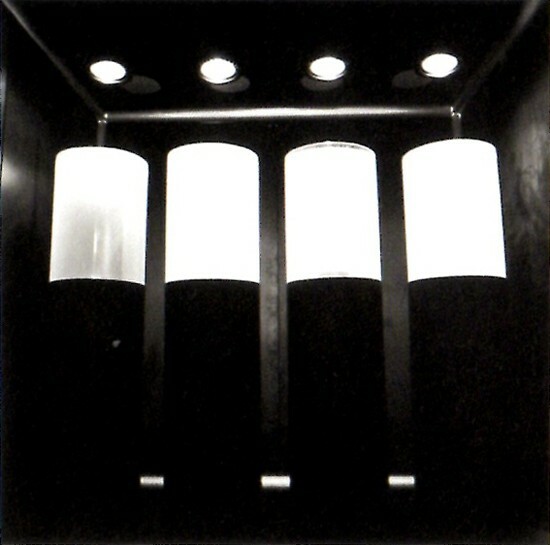 Installation view of Water Modulator (1969) at “Electromagica 69: International Psytech Art Exhibition,” Sony Building, Tokyo, 1969. ART iT: When you produced the “Electromagica 69” exhibition at the Sony Building in Ginza with local and international artists contributing installations incorporating television monitors, lasers and other electronics, what was the response – from the corporate side – to such activities? Were they interested in learning from the ideas of the artists? KY: The opposite was sometimes the case, in that based on the technology our ideas about art also changed, as with the Jikken Kobo auto-slide works. The relations between art and technology are always interactive. ART iT: How did you happen to receive the auto-slide projector from Sony? KY: We were connected to Sony through an introduction from a journalist who was attracted to our activities because of our name, “Experimental Workshop,” and knew about the auto-slide projector. ART iT: And at the time was Sony actively seeking to collaborate with artists in developing its technology? KY: I don’t think so. But they understood that it was a means for raising awareness in the broader public about their products. ART iT: You wrote that the desire to prevent the Osaka Expo from devolving into commercialism motivated the organizers of the Mitsui Group Pavilion to invite artists to participate. At the same time it seems there was a lot of criticism of the Expo’s mass appeal. Was that criticism based on frustration with the corporations? KY: It wasn’t just Mitsui Group that reached out to artists, there was also the Toshiba IHI Pavilion, supervised by Shinya Izumi, and the Pepsi Pavilion, in which Fujiko Nakaya participated as part of EAT. Journalists at the time were critical of anything that involved large-scale mobilization, including Taro Okamoto’s Tower of the Sun and the competitions between all the different pavilions. But this was not so much about art or technology as it was a social phenomenon. ART iT: You said that you are planning new works for the upcoming exhibition. Generally, you’ve tended to incorporate the most cutting-edge technology available into your projects, but this time do you have any plans to use new technology? KY: For me it was never about the newness of the physical platform. Updating the technology that exists in my head has always been more important. For example this new DVD project critiquing “virtual art” also includes paintings that I have made. But I am always critical. I am my own most severe critic as well. ART iT: Are you aware of the new video sharing technology on the Internet and sites like YouTube and NicoNicoDouga where all kinds of people can upload videos that they have made themselves? This phenomenon seems to be something that you anticipated when you first articulated the Imaginarium concept. KY: That was definitely something that I understood was possible when I was thinking up the concept. So now I’m a bit stumped, actually. For me the Imaginarium is far from complete. 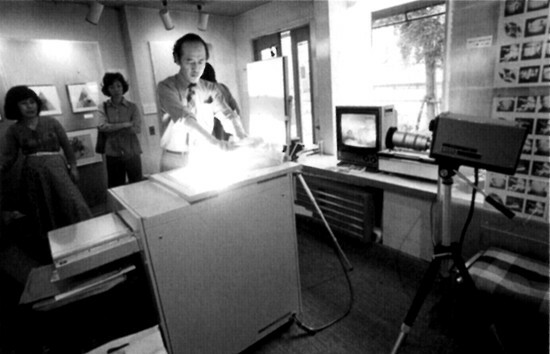 Above: Documentation of photocopying project held during the “Experimental Drawing Exhibition,” Ao Gallery, Tokyo, 1977. Below: Copygraphy (1977). ART iT: You have written that art always reflects society, and that is why the media used in art are constantly evolving. As you continue updating your thoughts in the midst of a constantly evolving society, when you attempt to realize the Imaginarium through creating environmental installations, does the reading of your works change with different social contexts over time? KY: The problem lies with the people doing the interpretation. The extent to which people are looking at things critically has always been the issue – even now. The Internet, video phones, all of that, it’s hard to say how critically they are understood. ART iT: When you say that you want to integrate the audience, the expectation is that audience members can enter a situation where they can share that critical spirit. But this seems actually quite difficult to achieve, in that maybe not all people are going to approach it that way. KY: The problem is also one of time and how responses change based on the timing of an encounter. When I make and exhibit works I pay a lot of attention to timing, and evaluate whether based on that timing they will have a socially “poisonous” or exhilarating effect. There are two sides to everything, and it’s important to be aware of that. My friend – and in fact, one of my former students at the University of Tsukuba – the media artist Toshio Iwai, was stung by a jellyfish once. At first he didn’t understand the cause, but then he realized it was a jellyfish. So in that case he encountered the poisonous side of the jellyfish, and got a nasty sting. Vitrine No. 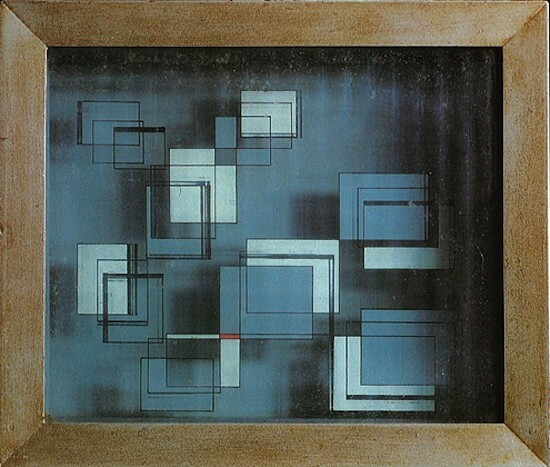 1 (1952), glass, oil paint and mixed media, 20.8 x 17.8 cm. ART iT: Aside from the continued refinement of the Imaginarium, are there any other themes that currently interest you? KY: At a certain point I suddenly developed an interest in ancient history, as opposed to new things, and started researching civilizations like those of Egypt and Greece. I am still researching them to this day, and plan to visit Greece sometime. Another thing that I’m researching now are the points when humans began using three-dimensional and two-dimensional forms of expression. From the beginning of representation it was common to paint directly on walls, and of course there was no photography then, so the images of figures like Cleopatra or Caesar remain to us in relief format. Even in the Lascaux caves the animal paintings there are essentially sculptural or three-dimensional representations. So I’m very interested in that and starting to research art history from this new angle. Art history is still far from complete. For me, it only continues to expand. I think it would be interesting to use a camera to film old Japanese wall and screen paintings. ART iT: Is this part of your investigation of two- and three-dimensional representation? KY: Yes, making the two-dimensional, or the flat surface, into a kind of sculpture. Shuzo Takiguchi made a film about Hokusai; I don’t know where it is anymore, but I hope to find it in time to include in the upcoming Jikken Kobo exhibition. The exhibition will certainly be our last word. Now there are only two other members left aside from myself: the lighting designer Naohisa Imai and the composer Joji Yuasa. At one point I was planning to recreate the auto-slide work by Tetsuro Komai, and then I actually found it. When I was at Tsukuba, I recreated the other auto-slide works by Kitadai, Fukushima and myself, at the same time transferring them to video format, which is what was on display recently in the Gwangju Biennale. For my own auto-slide work, Adventure of the Eyes of Mr WS, a Test-Pilot (1953/86), I did the narration myself, working from a very hard-boiled script that I had written. ART iT: That work was also on display at the start of this year in the collection exhibition at the Museum of Contemporary Art, Tokyo, “Chronicle 1945, 1951, 1957.” When I saw the work I thought it had overlaps in sensibility with the Japanese avant-garde cinema of the time, but was that necessarily something you were trying to achieve, and were there any filmmakers that influenced you then? KY: No. I liked Ernest Hemingway, and am actually the first person in Japan to translate his short stories. I read many of his works, as well as those of John Dos Passos. So my inspiration came from books, not films. I also liked Gertrude Stein’s poems, which through their surrealism evoked Shuzo Takiguchi’s own writing. In any case, almost all my knowledge comes from books, not films. ART iT: The circulation of information has really changed since that time hasn’t it. KY: It has. Now people get all their information not from books but from videos, and I find that a little scary. ART iT: When you established Jikken Kobo in 1951, many of the members were in fact quite young, and you yourself were only 22 at the time. Was that youth a contributing factor to the “experimentalism” of the group, in the sense not only that it might have made you more receptive to new ideas, but also in that you might not have experienced the full impact of the war as well? KY: Everyone was more or less in their early 20s. The oldest of us was Shozo Kitadai, who was born in 1921. I guess I didn’t fully experience the war. Following the first American bombing of Tokyo, the Imperial Headquarters issued a report that cited the wrong airplane type in describing the US bombers. I knew this because I had been watching everything through a pair of binoculars and noted it in my data book. I loved airplane spotting. 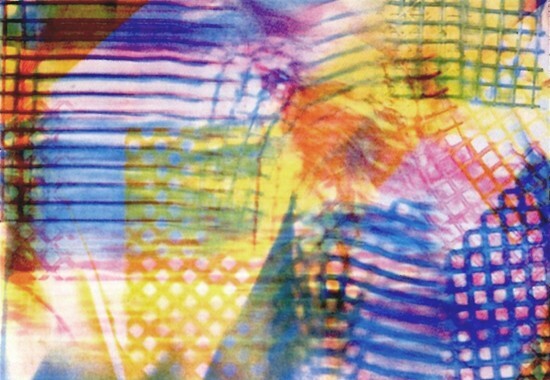 ART iT: That feels close to your interest in phenomenology, but which interest came first? KY: I actually aspired to become an aeronautical designer. I also loved researching warships. I knew all the models of airplanes in the world at the time, and most of the warship names as well, and it was all in my head. I still remember everything. Among the warship types, the battleship was always central but following that Japan put most of its effort into developing heavily armored cruisers. And there were also light cruisers as well. The Japanese ship names were very interesting. Many were named after mountains, like the Atago, after Mount Atago in Kyoto. Light cruisers were generally named after rivers, like the Mogami, after the river in Yamagata prefecture. Even now the Japan Self-Defense Force’s ship names continue that legacy, and all have good names, like the Japan Aerospace Exploration Agency’s Venus orbiter, Akatsuki (Daybreak) – names that are really classy, really very stylish. What kind of dreams do you have? I generally have two kinds of dreams. One kind is a dream of desire, and the other is a dream of reality. Usually when I’m sleeping, though, I don’t see the desire dreams. ART iT: “Reality dreams” – that recalls what you said earlier about poison and fun. KY: Certainly I feel that Freud’s theory of dreams doesn’t apply to me. There are two kinds of people, those that sleep well and those that don’t sleep well. I am able to control it. If I want to sleep soundly then I expunge all my desires. Formerly I used to see many dreams about my desires. I always wanted my own airplane, and loved making model airplanes. I had a dream once that an airplane crashed into my family garden, and was stuck in the trees, and then I could finally claim an airplane for my own. That was a desire dream. But then the bad dreams that I see are sickness dreams. I’ve had them since I was a child. If I see such a dream then I will become sick, or maybe it’s that if I become sick I will see such a dream, I’m not sure which way it works. ART iT: I actually keep a dream log. KY: Really? There are many people who keep dream logs. Takiguchi also kept a dream log. There are people who are still keeping their logs even now. You can usually tell who does. Born in Tokyo in 1928, Katsuhiro Yamaguchi is currently based in Yokohama. In 2006 he was the subject of the retrospective “Katsuhiro Yamaguchi: Pioneer of Media Art – From ‘Experimental Workshop’ to Teatrine” organized by the Museum of Modern Art, Kamakura & Hayama, and the Museum of Modern Art, Ibaraki. He was recently included in the 8th Gwangju Biennale, “10,000 Lives,” held in Gwangju from September 3 to November 7, 2010.